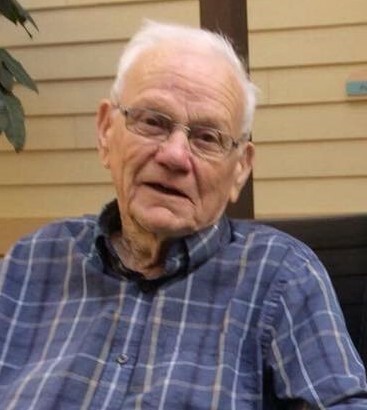 It’s with heavy hearts that the family of Earl William Bruce, loving husband of Etta (Storey) Bruce, announces his passing on February 6, 2019 at the Loch Lomond Village. Born 1929 in Hayesville, NB, he was the son of the late Harold and Jeanette (Taylor) Bruce. Earl worked hard all his life as a Truck Driver then a School Bus Driver/Custodian. He was an avid sports fan who enjoyed watching horseracing, but most of all spending time with his family and friends. In addition to his loving wife of 68 years, Etta, he is survived by his sons Harold, Eric; daughter Cathy (Lisa) Bruce; sons-in-law Joseph Wilson and Kenneth Paley; sister-in-law Ruth Bruce; 9 grandchildren and 9 great-grandchildren. Earl was the last surviving member of his immediate family. Besides his parents, he was predeceased by his children Jean Paley, Marilyn Wilson and Ronald Bruce; brothers Lloyd, Blake, Darrell, Carl and Lawrence as well as sisters Glenna Calhoun, June Tait and Flossie Loveless. Arrangements are under the direction of Fundy Funeral Home, 230 Westmorland Road. By request there will be no visitation. A Memorial Service will be held at Fundy Funeral Home on Saturday February 9, 2019 at 2 p.m. Interment will be held in Ocean View Memorial Gardens at a later date. The family would appreciate donations to the Loch Lomond Villa Foundation or charity of one’s choice.